TOMATO PIE IS FULL OF MOUTHWATERING TOMATOES, BASIL, MOZZARELLA, AND PARMESAN. GARDEN FRESH HEIRLOOM TOMATOES AND BASIL TAKE THIS RECIPE FROM GOOD TO AWESOME. If you have never had the pleasure of a Fresh Southern Tomato Pie than you really must treat yourself. 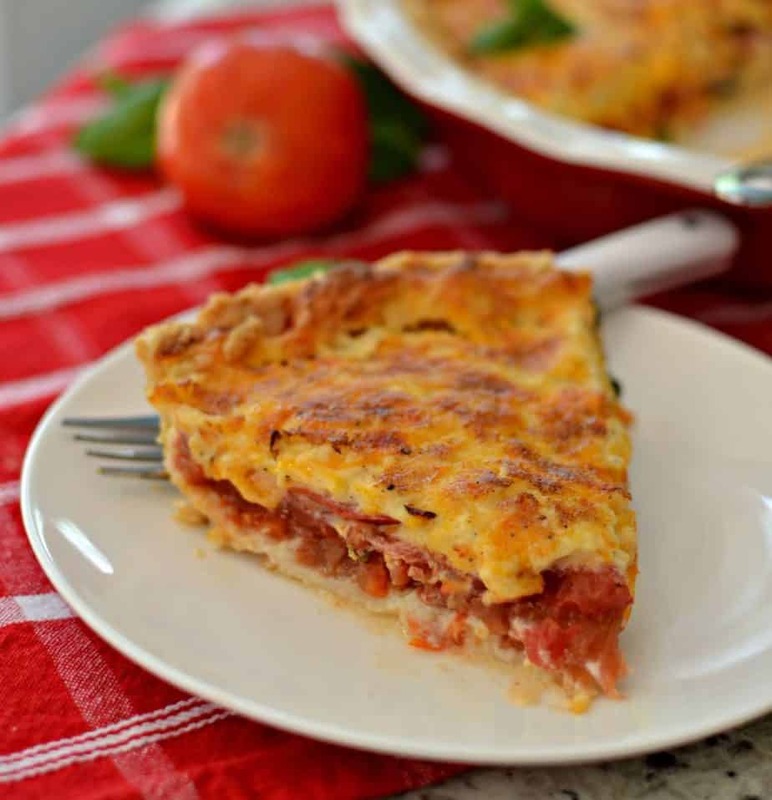 Tomato Pie is a delectable summer treat that I don’t think anyone should miss. Combine fresh sun kissed summer tomatoes, fresh aromatic basil, creamy mozzarella and and flavorful Parmesan and you have a pie full of the best of summers bounty. It is perfect for a light breakfast or lunch served with a cold glass of cucumber agua fresca. If you love tomatoes like I do than this is a must try! First wash and slice your tomatoes thin. Layer them on racks with paper towels underneath and salt the tomatoes. Let sit for 10 -15 minutes. Flip the tomatoes and repeat. 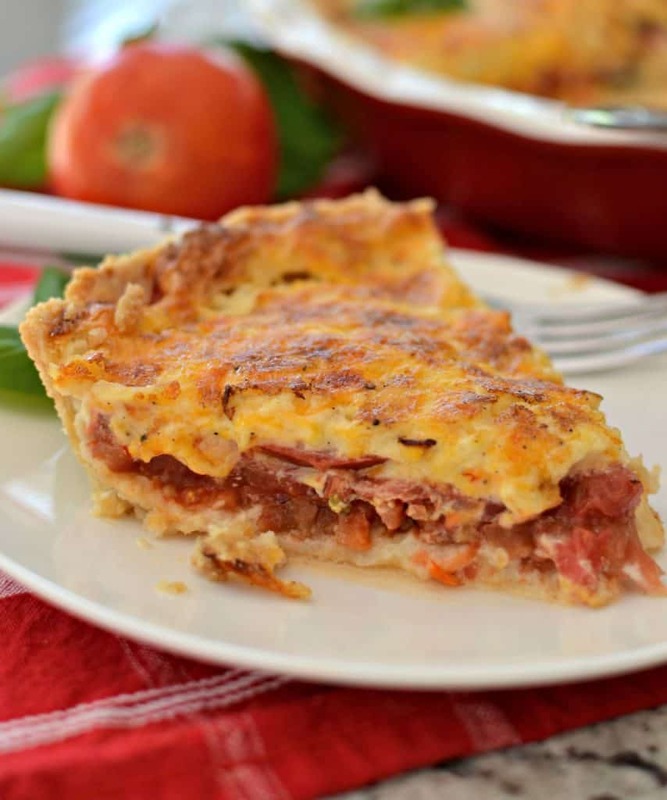 Use either a fresh or frozen pie crust that has been pre-baked so it does not get soggy from the tomatoes. This recipe includes an easy pie crust that you mix right in the pan. Layer the pre-baked pie crust with a thin layer of mozzarella cheese, followed by a layer of tomatoes and a sprinkling of chopped basil. Repeat with layers of tomatoes and basil. Mix together mayo, cheddar, mozzarella, Parmesan and garlic. Smooth over the top and bake until lightly browned on the top. Wait 20-30 minutes before slicing this pie. This pie can be served hot, warm and even cold although I think it is best warm ( a little over room temperature). WHAT ARE THE BEST TOMATOES FOR TOMATO PIE? 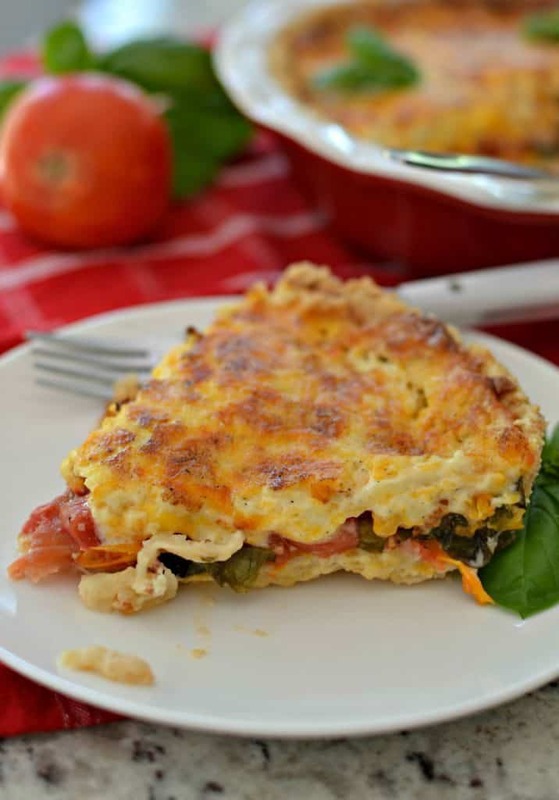 I am of the opinion that no tomato should be left behind however the meatier ones work better with this recipe ensuring a flaky not soggy crust. I personally like the meaty heirloom tomatoes or roma tomatoes. The trick is using salt efficiently to remove a lot of excess moisture. Pre-bake the fresh or frozen crust so that the crust remains flaky once the tomatoes, basil and cheese have been baked in it. Use a thin layer of cheese on the bottom to once again ensure a flaky crust. Choose meaty tomatoes therefore reducing the amount of moisture in the pie. Salt the tomatoes and pat dry with paper towels consequently ensuring a delicious perfect pie. Wait 20-30 minutes before slicing this pie. It allows all the ingredients to set up hence producing cleaner sturdier cuts. OTHER TOMATO RECIPES YOU WILL LOVE! 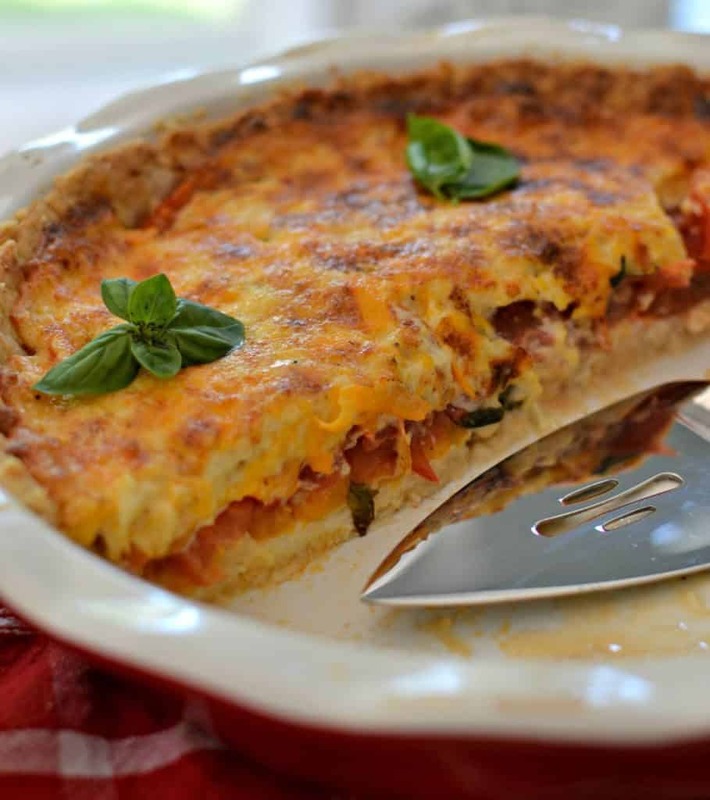 Tomato Pie is full of mouthwatering tomatoes, basil, mozzarella and Parmesan. Garden fresh tomatoes and basil take this recipe from good to awesome. Preheat oven to 400 degrees. Mix all the ingredients in the pie pan itself. Pat the mixture in the bottom and up the sides of the pan. Poke holes in the bottom and up the sides. Bake for 12-13 minutes or until lightly browned. Lay sliced tomatoes on racks in sink or over paper towels. Sprinkle with salt and wait 10-15 minutes. Flip and sprinkle other side with salt and wait 10-15 minutes. Sprinkle bottom of cooled crust with 1/4-1/3 cup of mozzarella. Layer the inside of the crust with tomatoes and basil alternating between the two. 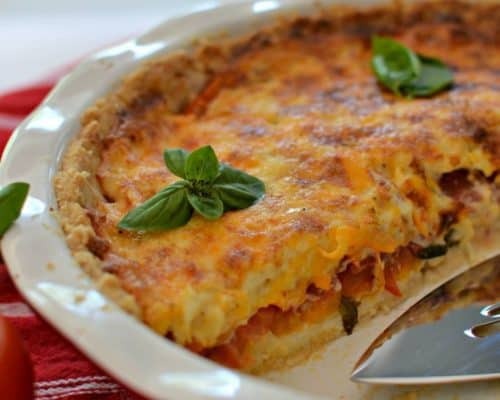 In small bowl combine remaining mozzarella, cheddar, Parmesan, mayo and garlic powder Spread evenly over the top of the pie and bake at 350 degrees for 30-35 minutes. Cool for 20-30 minutes before serving.